Inspired by the story of Princess Sophia Duleep Singh, whose contribution to the suffragette movement remains largely unrecognized, this is my exploration, from my perspective as a new British citizen and a woman of Asian origin, of what it means to belong. 'The Hundred Names of Darkness' Audiobook - Mara and the Nizamuddin cats rise again! It was a delight to revisit Mara and her band of feral cats as they faced a terrifying, ruthless new enemy in this excellent sequel to Nilanjana Roy's 'The Wildings'. Creating the voices for a whole new array of Delhi's wild animals was a lot of fun! Zara busts in on Al’s photoshoot with Leatherbridge Life journalist Claudie Mortcombe! Shortlisted for the Commonwealth Prize (2013), the Shakti Bhatt First Book Award (2013)and the Tata First Book Literary Award (2012), 'The Wildings' by Nilanjana Roy tells of the captivating adventures of a band of feral cats fighting for survival in old Delhi, and their unlikely leader Mara, a tiny cat with extraordinary powers. originally started by David Mitchell on Twitter . Told by the various characters tied inexorably to the elusive Slade House, this unsettling 'ghost' story, was a thrill to record. "I'm telling you stories. Trust me..."
Tania has co-narrated with Daniel Pirie, this magical, lyrical tale of Henri, Napoleon's soldier-chef and Villanelle, the extraordinary daughter of a Venetian boatmen, whose passionate personal stories are set against the grim background of the Napoleonic wars. Deepti Kapoor is one of three writers commissioned from around the world, to contemplate the subject of 'getting away from it all'. In 'Namaste' she "considers the Western tourists who have long headed to Goa for a dose of healing spirituality - and an Indian woman who tries to find a solution to her own troubles by offering the visitors what they seek." Tania was delighted to record Nuala Calvi and Duncan Barrett's new novel - 'The Girls who went to War', which tells the true stories of three women who served in the forces in the Second World War. In telling their stories, Nuala and Duncan also draw for us a detailed and eye-opening picture of women's lives In WW2. To read more about the extraordinary women who shared their stories, take a look at the 'Girls who went to war' website. Raj Kamal Jha weaves together a dark and extraordinary magic-realist tale, that looks at Delhi through a harsh yet compelling kaleidoscopic lens. Juxtaposing the stories of 'Woman', 'Man' and 'Child' in a provocative, experimental and cinematic style that demands your attention on the page, it was very exciting to translate into audio. 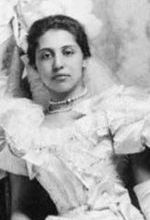 Princess Sophia Duleep Singh was not only the daughter of a Maharajah, and goddaughter of Queen Victoria, but she was also a staunch activist, in the inner circle of the suffragette movement, right alongside Emmeline Pankhurst. Tania was thrilled to record 'Sophia', Anita Anand's wonderfully researched and skillfully written biography of a truly extraordinary woman, whom history and the Raj have tried to erase. Tania will be appearing as consultant psychiatrist Dr Wendy Cartwright in Holby City - look out for it in Christmas week! Tania was delighted to narrate the extraordinary epic story of feisty Ruling Lady, Mara of the Acoma, and her struggle for survival amidst the clash between the intrigues of Tsurani politics, the influence of alien worlds and the machinations of the Magicians, in this wonderful trilogy by Raymond E Feist and Janny Wurts . Now available from Harper Audio/Audible. Tania has just completed recording three books by Kamila Shamsie. who was selected as one of Orange's 21 Writers of the 21st century. Her next novel, 'Kartography', received widespread critical acclaim and was shortlisted for the John Llewellyn Rhys award in the UK. It is a love song to Karachi, told through the eyes of Raheen as she tries to understand her relationship with her childhood soul mate Karim. a search which leads her deeper into an extraordinary personal and political mystery. All three books are now available to download on Audible.